More People Care About Their Job Today. Here's Why. It’s a classic case of good news, bad news. 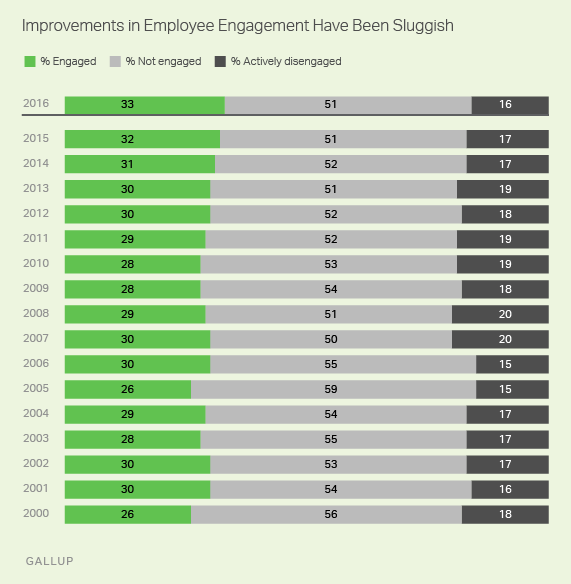 The good news is that Gallup – the leading authority on employee engagement – just released their annual report. The headline? Employee engagement in America is the highest it’s been since Gallup started measuring it in 2000. The bad news: the numbers still aren't great. 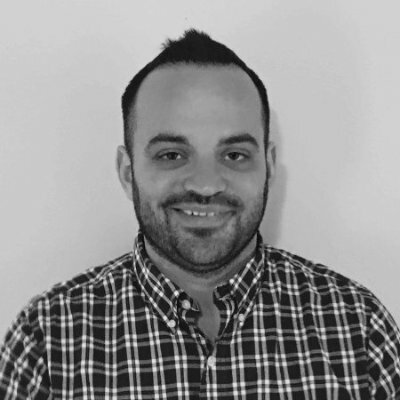 A mere 33 percent of Americans employees are engaged, with engagement being defined as someone who is psychologically committed to their job and is likely to make a positive contribution to their organization. Thirty-three percent represents a slight uptick of 1 percent from the year before. Meanwhile, 51 percent of American workers are disengaged with their jobs, meaning "they lack motivation and are less likely to invest discretionary effort in organizational goals or outcomes." The remaining 16 percent are actively disengaged, meaning "they are unhappy and unproductive at work and liable to spread negativity to their coworkers." Two questions arise from this data: why is employee engagement up, albeit slightly? And why is it still so low, and how can it get higher? Before answering those two questions, let’s first define what Gallup means by employee engagement. While that sounds like a squishy term, Gallup has a research-backed, 12-question survey to determine employee engagement. Basic needs, covering what the employee gets (questions 1 and 2). Individual needs, covering what the employee gives (questions 3 to 6). Teamwork needs, covering if the employee feels accepted (questions 7 to 10). Growth needs, covering how the employee can grow (questions 11 and 12). By asking professionals these questions, Gallup can determine how committed they are to their job, i.e. their engagement level. Granted, employee engagement is only up 1 percent this year and 3 percent since 2012. But, when you are talking about an American workforce of more than 100 million people, that means millions more Americans care about their jobs. Question 4, more recognition: More organizations are doing a better job of determining how employees like to be recognized; are praising employee’s good work while also recognizing why the work was important; and encouraging all employees to praise each other, not just managers praising their direct reports. Question 7, valuing opinions more: More organizations are promoting open, creative dialogue; are encouraging employees to provide more ideas; are giving more open and honest feedback on employees’ opinions; and are creating feedback loops so employees feel involved in the decision-making process. Question 12, providing opportunities to grow: More organizations are challenging their employees in positive ways; are working with them to develop short-and-long-term goals; are creating learning paths for their employees and consistently checking in on that progress; and are encouraging employees to take on new roles and responsibilities within their organization. It’s great that engagement is higher, thanks to those three factors that (some) organizations are doing better. But, 33 percent is hardly anything to celebrate. Unfair evaluation practices and misplaced accountability. All three of these factors are symptoms of the same problem. Managers aren’t setting clear goals for their employees (point one), which is making it difficult to provide feedback and evaluate their employees performance (point two and three). So how should organizations fix this? It starts with clear goals at the top. If leadership prioritizes a few key metrics, it makes it much easier for every team and employee to build goals around that. From that, each manager needs to develop clear goals for each one of their employees. There should be two tracts of goals here: business-focused and career development. Business-focused goals are metrics an employee needs to hit to do their job. So, for sales, a sales quota; for customer service, a customer rating; etc. The clearer these metrics are, the easier it is for employees to judge themselves and for managers to provide feedback. Career development goals are a different breed. This is what the employee wants to get better at to reach their goals. Maybe, they want to become a manager, so they need to improve their leadership skills. Or, they want to become an expert in their field, so there’s a technical skill they need to work at. Perhaps they want to try something significantly different than their current role. Rather than ignore their request and risk losing them to another organization, encourage lateral movement within your organization. Again, the clearer the goal here, the easier the manager can provide meaningful feedback. With this approach, the manager becomes more of a coach, and less of an authoritarian. The Gallup Report is an annual reminder of the world’s untapped potential. Imagine how much more vibrant and happier earth would be if the majority of professionals loved their jobs, instead of a mere 30-odd percent. And yet, year after year, the report paints a dismal picture. Despite organizations spending billions on engagement, the improvements so far have been relatively minor. To some degree, that’s the fault of employees’ themselves. Personal responsibility plays a factor here. But it’s also the fault of organizations. Just simple things, like organizations having more clearly defined goals and managers providing more actionable feedback, would make a tremendous difference in engagement numbers and our collective performance overall. Want to see how organizations build cultures of learning at their organizations? Check out our Workplace Learning Report, where we surveyed 500 learning and development professionals to find out what’s working – and what’s not.